There is a strange creeping disease here in suburbia. Cheap credit, eager builders and a wealthy middle class have all led to a situation that enables already sprawling houses to expand their architectural waistlines. It is an imposing semi-detached trend in domestic obesity which allows (under the guide of ‘permitted development‘) for any kind of ballooning construction methodology to exist. The properties in this home county enclave are a typical collage of pseudo historical English styles immediately reminding me of that Benjamin line ‘the past being over and done with now falls prey to our inventions’, innovation and authenticity are typically sacrificed in the name of formal banality and spatial gluttony. Semi-detached houses merging. Image © Google Streetview. 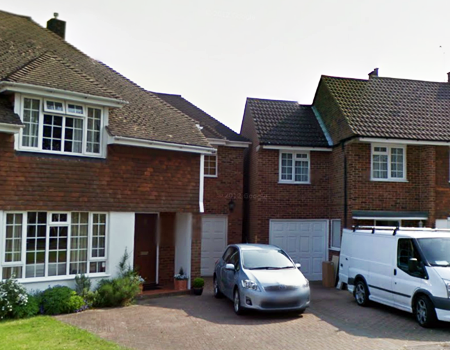 The results of this growth are an array of bulging house extensions which are defined by raw planning limits alone. This building work gives rise to a strange ribbed strata of bright red bricks. Ground floor rooms are stretched to geometric plot boundaries and first floors though set back from the invisible edge still lunge outwards. Paving slab and block-work now suffocates any vestiges of greenery and the interior chambers swell and creep. This proliferation of distended residences is a territory already claimed by science fiction writers. First is Ian McDonald whose wonderfully poetic novel Hearts, Hands and Voices is a heart achingly rich allegorical novel of conflict and trauma that pits DNA welding nature lovers with bulbous living houses against the savage mechanisation of the urban autocratic masses. I’m reminded too of China Miéville’s book Embassytown which is located on an alien world where humans have settled among strange horse-coral-fan-insectoid entities who utilise a living technology. One character Avice describes a journey in which ‘we crossed over the zone where the architecture went from the brick and ivied wood of my youth to the polymers and biorigged flesh of the Hosts, from alley-tangles to street analogues of other topographies. Building things were coming down and being replaced. construction sites like combined slaughterhouse, puppy farms and quarries’. Structures throb and belch like HR Giger paintings and spaces within them overlap and unfurl like foetid fungal reefs. Strata of extended rooms. Image © Google Streetview. It is a particularly ugly kind of response to territorial greed. 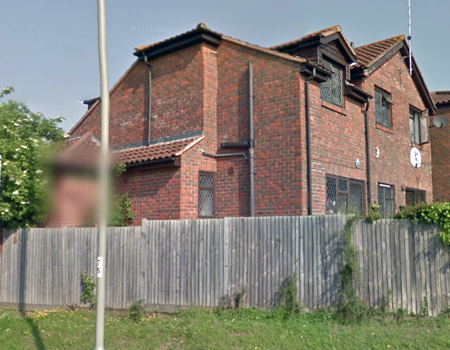 These are not cramped or damp Victorian terraces, but often ranging middle class detached homes which appear terrified of the natural world lurking outside, part of ‘the middle-class demand for increased spatial and social insulation’ as observed by Mike Davis. Driveways too are paved over for an armada of snarling BMWs and Audis. When rain storms frequent the neighbourhood flash floods can occur as surging water desperately seeks any natural crevice to soak into. The hard surfaces actively combat the environmental regulation of soft foliage and amplify the torrents sweeping over the streets. The locality is thankfully saved by an abundance of dense trees scattered next to public pathways as well as the ghosts of old country lanes and leafy copses acting as green lungs (which I’ve previously written about). In many ways this suburban process of folding space attempts to formulate an endless and sterile labyrinthine interior. This echoes a number of historical precedents that wove entirely new layers of inhabitation into tortured and fixed cityscapes. Some of the most famous examples include both the Jewish Quarter in Venice (a locale which gave rise to the word ghetto) and Kowloon Walled City in Hong Kong. Jewish citizens in Venice were forced to live within strict confines and over time the towering blocks became increasingly dense as residents tried to carve out a degree of comfortable living within the fixed extremities. Cristiana Facchini notes ‘at the outset of the seventeenth century, the Venetian Jewish population had visibly increased. The ghetto had expanded and its social and cultural structure had metamorphosed into a microcosm of different Jewish sub-cultures.’ Rooms and courtyards bifurcate like malignant cells weaving a claustrophobic tapestry of daily life into the perilous islands of the swampy delta. 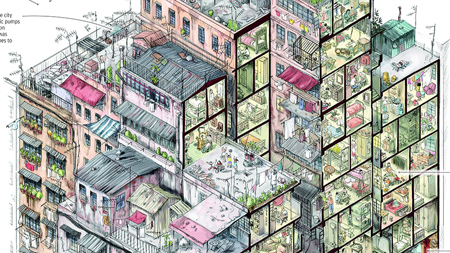 Kowloon Walled City was a torus knot of crumbling apartments compressed into 6.5 acres. Finally demolished in 1992, the fractal autonomous realm was ruled by anarchic gangs and effectively abandoned by the wider urban authorities. Without planning control its occupants embraced every single surface in an attempt to fortify their impoverished position with useful devices such as balconies, antennas and air-con units. It was described by a character in William Gibson’s novel Idoru, ‘There was a place near an airport, Kowloon, when Hong Kong wasn’t China, but there had been a mistake, a long time ago, and that place, very small, many people, it still belonged to China. So there was no law there. An outlaw place. And more and more people crowded in; they built it up, higher. No rules, just building, just people living. Police wouldn’t go there. Drugs and whores and gambling. But people living, too. Factories, restaurants. A city. No laws.’ Kowloon’s compressed mayhem neatly demonstrates the bleak logical conclusion of our collective desire to expand the territory of occupation. Kowloon cross section. © Illustration from Chaotic city of Darkness/ Greg Girard. Is there any hope for green space and wildlife in our suburbia, especially in the light of the current government’s drive to further deregulate planning regulations? Natural Deficit Disorder has been posited by Richard Louv as a (hypothetical) syndrome suffered by inhabitants of this cleansed realm of artifice. He writes ‘since the 1970s, kids have spent a decreasing amount of time playing in nature and the trend quickly is worsening’. Partially in an attempt to fight this insular drift the National Trust have launched 50 things to do before you are 11¾. Their stated aim is ‘to encourage kids to get mucky, discover their wild side and most of all enjoy what Mother Nature has to offer!’. It is an optimistic programme which endeavours to directly fight the brutal interiorisation and sanitisation of the cold metropolis, one in which the keen inhabitants can look outwards towards the welcoming sunshine. The desire for security and withdrawal helps feed our hungry feedback loop of selfishness. By not embracing the natural order we retreat ever further into ourselves, lost within the origami folds of masonry. There is a wonderful Borges conversation about a similar Möbius loop of annihilation, one of Greek tragedy and loss, ‘This has happened and will happen again,’ said Euphorbus. ‘You are not lighting a pyre, you are lighting a labyrinth of flames. If all the fires I have seen were gathered together here, they would not fit on earth and the angels would be blinded. I have said this many times.’ Then he cried out, because the flames had reached him’. When the organic world terrifies us, this self destructive urge fuels our own flickering fires of ignorance. This endotic trauma can be regarded as part of a wider municipal problem of maturing urbanisation. Mike Davis again, ‘the failure… to address, or even grasp, the acuity of the suburban malaise explains, in turn, much of the populist rage that currently threatens the two-party status quo. America seems to be unravelling in its traditional moral centre: suburbia’. The sprawling domestic landscape is consumed by its schizophrenic lust to both comfort and sedate us. To quote W.H. Hudson ‘in this as in other things our gain is our loss’, as we are intimately linked with and part of our local geography, all manner of cement swaddling cannot compensate for the loss of the exterior. We can only hope that Radiohead’s sullen fake plastic trees referenced at the beginning are replaced by blossoming real ones in an effort to prevent the desertification of suburban zones.